The senior quarterback finished with 155 yards on 14-of-24 passing. "I think people can nitpick quarterbacks pretty hard and I’m going to nitpick myself pretty hard," Browning said. SALT LAKE CITY — There was Jake Browning at his worst — backpedaling, spinning, flailing and falling backward as the defense surrounded him, then making an ill-advised throw resulting in an interception. And there a short time later was Browning at his best, backpedaling in the pocket, buying time on third-and-long, eventually finding a wide receiver for a first down. Those two plays in the fourth quarter typified and up-and-down performance for Washington’s senior quarterback in the Huskies’ 21-7 victory at Utah late Saturday. 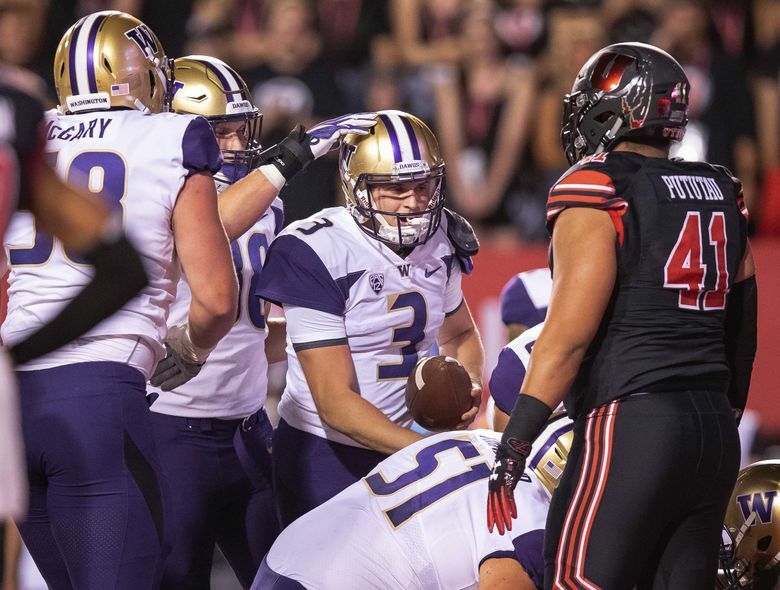 Browning threw a touchdown pass, ran for a touchdown and helped the 10th-ranked Huskies open Pac-12 play with an important victory on the road against one of the conference’s top defenses. And yet for many the lasting image of the QB’s night will be of his interception early in the fourth quarter that nearly turned into at Utah touchdown. And to that notion, Myles Gaskin has a quick retort. Browning finished 14-of-24 for 155 yards with a 6-yard touchdown pass to Ty Jones and a 1-yard TD run. Offensive coordinator Bush Hamdan shrugged off Browning’s interception too. Browning’s touchdown pass to Jones was the 82nd of the quarterback’s career, moving him into a tie with Andrew Luck for 11th place on the Pac-12’s all-time list. Washington’s beat-up offensive line got some good news Saturday. Junior center Nick Harris returned to the starting lineup after missing the previous game against North Dakota with an apparent left leg injury. Harris then left the Utah game in the second half with an undisclosed injury. The Huskies have already been without senior left tackle Trey Adams, a preseason All-American who is expected to miss significant time after having back surgery. Junior Jared Hilbers made his third consecutive start at left tackle in Adams’ stead. UW coach Chris Petersen earlier in the week pointed to the offensive line’s inconsistent play as the primary reason for the run game’s slow start to the season. — Junior linebacker DJ Beavers (foot) did not make the trip. A starter for the season opener against Auburn, Beavers has missed the past two games. — Junior punter Joel Whitford did not make the trip either. He remains out with an undisclosed injury.